For specifiers, the past few years have been challenging in terms of adjusting to lighting industry changes. Technologies—as well as the companies and supply chains behind them—are evolving almost as fast as new systems can be installed. 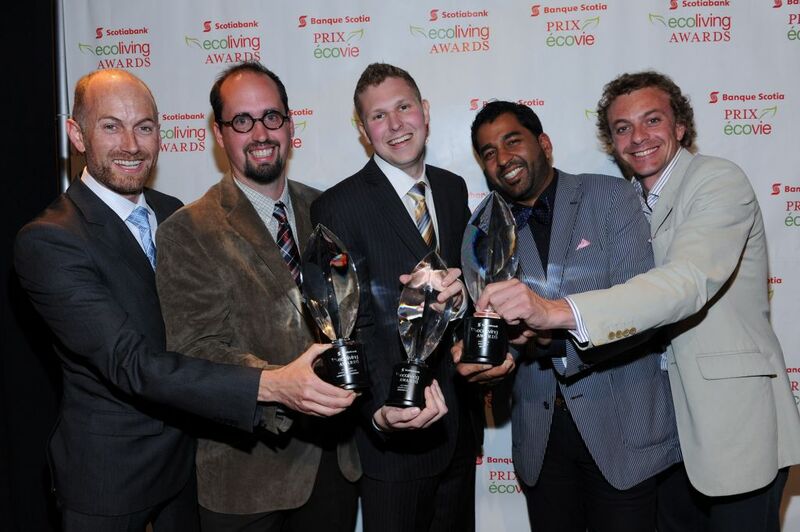 Scotiabank EcoLiving winners (left to right), Lanefab Design/Build’s Bryn Davidson and Mat Turner, University of Manitoba student Benjamin Gillies, and Quinzee creators, Faizal Karmali and Lee Bremer. Photo courtesy Sam Santos/George Pimental Photography. Three winners of this year’s Scotiabank EcoLiving Awards were honoured with a total of $75,000 for home efficiency designs and products. The EcoLiving program aims to help Canadians reduce energy bills by using more efficient systems. This year’s awards program received 78 entries from across the country—an increase of 28 per cent from 2012. The entrants must be able to garner public interest in their inventions as part of the entry criteria. Winners were chosen by a panel of industry experts. The winner of the $50,000 Business Leadership Award is Vancouver’s Lanefab Design/Build. The company builds custom and infill (or laneway) homes with a focus on energy efficiency and preservation of existing neighborhoods. Quinzee, based in Toronto, was awarded $15,000 and the Innovators Award for a mobile app that enables Ontario residents to be able to monitor their energy consumption and spending. Finally, the Student Leadership Award valued at $10,000 was presented to University of Manitoba graduate Benjamin Gillies for his apartment complex prototype, FAACE (Functional, Affordable, Attractive, Compact and Efficient). The EcoLiving website, acts as an online resource for home owners to compare and plan efficient home renovation projects.